One of the best things about living in the high country as I do in Evergreen (even if it is only 30 minutes from downtown Denver) is sharing the beauty of our area with friends and family. Whether an extended stay or just an overnight visit, don't you wish you could offer a small cabin or "bunk house" to your friends for the night. That's exactly what residents of my real estate market in Evergreen, Morrison, Golden and Conifer can do now. 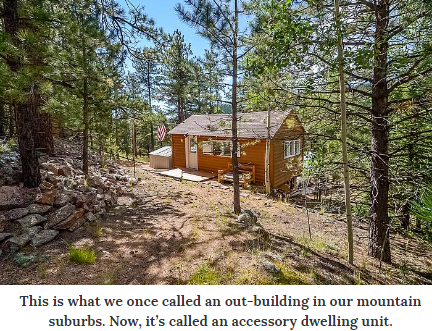 With Jefferson County's new Accessory Dwelling Unit (ADU) approval, this dream is much closer. Jefferson County Zoning just approved an ADU of a 1200 sf or 40% of the primary home for any number of uses. Of course there are lots of regulations related to the construction, but the benefits are spectacular for home owners with a minimum of an acre of land. The ADU can be attached or detached to the primary home. Windows have to protect the privacy of neighbors. The ADU should match the design of the primary home. The ADU must be permitted and meet setback, height, and parking restrictions . No more than 1 ADU shall be allowed on any property. The owner of the property must occupy one of the dwelling units so you can't build an additional building and rent out both homes. If the primary and proposed ADU is on a well, the home owner must get a letter from the Colorado Division of Water Resources stating the well permit can provide water for both dwellings. If the homes are services by a septic system, the home owner must prove that the current septic system will accommodate the ADU or modify the septic system as necessary to support the ADU. No more than 3 people can occupy the ADU. This is a real bonus for folks who own homes in mountain areas of Jefferson County like Evergreen, Conifer, Morrison and Golden, Colorado. The addition of another dwelling on your property can enhance the value tremendously. Many people are looking for a home with a guest house, or a private, but protected area for an aging parent or grown child. So, now, if the property you does not have an accessory building, you can consider adding one yourself! If you would like more information, please contact me on the form below. I will get whatever information you need or answer any questions about living in the Evergreen, Conifer, Golden and Morrison area. 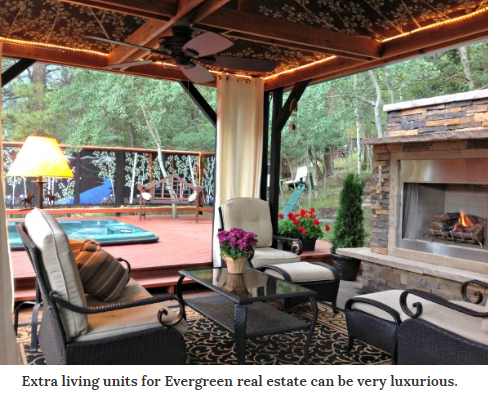 I have been living in Colorado since the 1970's and selling Evergreen real estate since 1999.